With “winter storm” Juno reminding us that, yes, it’s unfortunately still winter, we realized that it was probably time to step up our skincare routine to give our skin the hydration it so desperately needs this time of year. Luckily, our beauty cabinet is far from short of an army of masks to choose from. After applying the face mask and letting it sit overnight (the best method and, conveniently, the laziest), our skin was refreshed and had us looking like we’d just returned from a tropical beach vacation (sun-kissed tan not included). 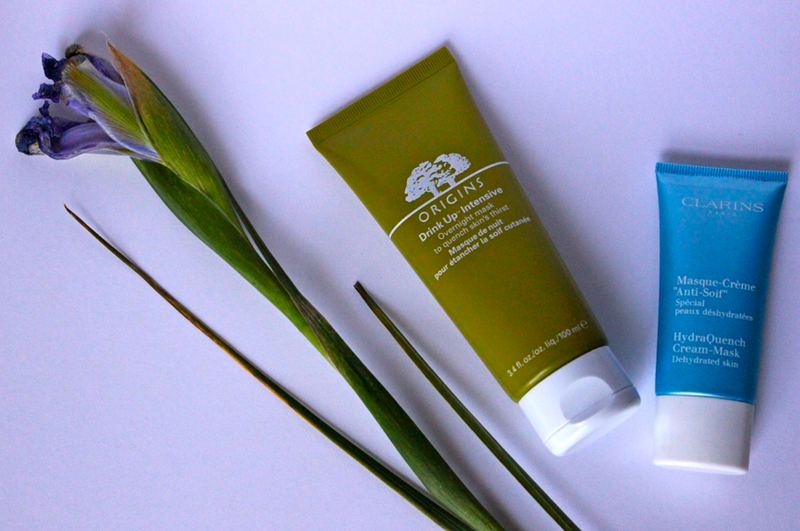 These are some of our favorite overnight face masks, but we’re always on the lookout for new options to try, so don’t hesitate to clue us in to your skin saviors in the comments. Origins Drink Up Intensive Overnight Mask – smells delicious, invisible when applied to the skin (perfect for long-haul flights!) and is the mask that kickstarted our love for leaving masks on overnight. Clarins HydraQuench Cream-Mask – the perfect beginner mask. This one only needs five minutes to work its magic, so it’s perfect for the mornings when your skin is looking rough but you’ve already pressed ‘snooze’ twice. Not pictured but still noteworthy: First Aid Beauty’s Facial Radiance Overnight Mask – the gel-cream formula makes applying a dream and your face much brighter and smoother the following day. GlamGlow THIRSTYMUD Hydrating Treatment – though this is by far the most expensive of the bunch, the “extreme hydration active technologies” leave your skin as soft as ever.